BEIRUT, Lebanon – The Free Patriotic Movement and its leader Gebran Bassil snapped back at Lebanese Forces leader Samir Geagea in a statement Thursday, after he gave a televised interview with local news channel MTV, criticizing the FPM for hindering the government formation process. “Personal and collective political suicide is when a person harms himself, his brother and his community for the sake of political ministerial gains and a transient political moment,” Bassil tweeted. The movement also reminded Geagea that the president’s independent share was mentioned in the now-suspended Maarab agreement between the two parties. “We ask the LF’s chief if this is how the president and his jurisdiction and tenure can be supported, while noting that any current concession would not only affect this presidential term but also the future presidential terms,” the FPM added. Competition between the two parties over Christian representation in the next government has been one of the main reasons for the protracted government deadlock. The LF has been calling for an increase in its ministerial representation since the party nearly doubled its number of MPs to 15 seats in the May 6 parliamentary elections. Ministers and party leaders have been unable to agree on a formula to determine the number of ministerial seats each bloc will get, and Geagea criticized Bassil for tailoring the criteria to benefit his parliamentary bloc, in his Wednesday night interview . Geagea said that according to the Maarab Understanding – signed by the FPM and the LF in 2016 with the aim of achieving inter-Christian reconciliation, the LF and its allies get six seats in the Cabinet. “And according to … Bassil, the LF represents 31 percent [of the Christian representation], which gives the LF five ministers. Bassil still does not accept this, and is hindering the formation using the president’s signature,” Geagea said, referring to a representation criteria based on a party’s popular size. Bassil’s ‘Strong Lebanon ‘ parliamentary bloc and its allies comprises 29 lawmakers. Bassil was reported to be seeking 11 ministers for the FPM and President Michel Aoun’s share, which would grant him a veto power in a 30-member government. “The Strong Lebanon bloc is not only the FPM, it is a combination of the FPM and other MPs. 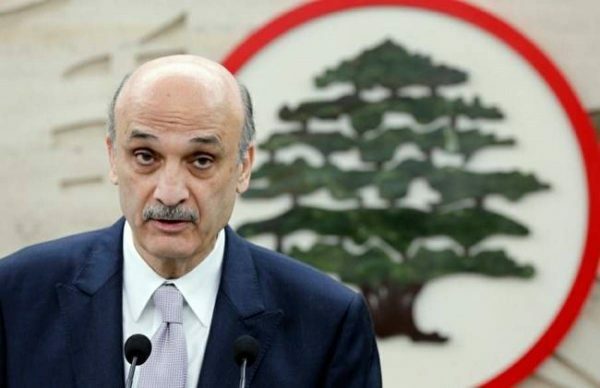 Using the number of MPs to calculate the number of seats in Cabinet gives the LF four seats, and gives Strong Lebanon seven seats … but they want to apply this criteria to the LF only,” Geagea said. But according to Geagea, the accurate representation of Christian shares – according to parliamentary, political and popular size – would give eight ministers to the Strong Lebanon bloc, five to the LF, one to Kataeb and one to the Marada Movement. “The president’s position and the position of the head of the FPM are being mixed together. A president is everyone’s president, and the head of the FPM is for the FPM,” Geagea said. Geagea stressed that the LF was not responsible for delaying government formation. “Those hindering government formation will not be able to do it for long, because the majority in Lebanon want to form it as soon as possible,” he told MTV. “Once the true representation of the LF … is accepted, the government will be formed,” Geagea said. Geagea criticized the FPM’s handling of the electricity issue, as the party has long controlled the Energy Ministry. He said that the FPM “has not made any progress on [electricity] in 15 years.” He called for handing over the electricity portfolio to another party, and if they failed, “we will hold them accountable for it just like we do with FPM,” Geagea said. But the FPM claims that the barges cannot be be stopped because the they have become an essential part of the Lebanese electricity supply. Commenting on the reported call between Aoun and embattled Syrian president , Geagea said: “I do not accept that President Aoun hold talks with Bashar al-Assad. This is unjustifiable and unnecessary, ” stressing that Assad is a party to the Syrian conflict. He stressed that Prime Minister-designate Saad Hariri will not step down from the mission of forming a new government. “PM-designate Saad Hariri will not be cornered and will not step down. If some believe that they can press him to step down they are mistaken,” Geagea told MTV. It looks really pathetic. And yet, it just might be that Lebanon – like Belgium – is actually better-off without a functioning government.